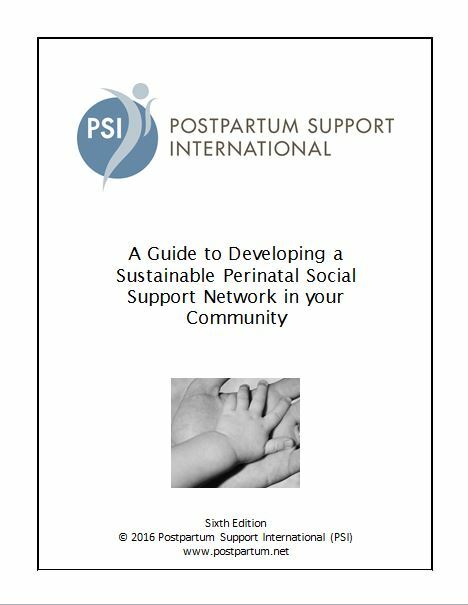 This 66-page booklet provides suggestions and solutions for creating a perinatal support network of any size in your community. It is full of practical information such as developing support organizations, running phone lines, training volunteers, developing a resource list, suicide prevention in social support, giving community presentations, leading support groups, and becoming a not-for-profit organization. It is intended for anyone who is working to provide support, raise awareness, or create networks for perinatal mental health in their communities. The guide was created as a team effort of 10 successful social support organizations in the U.S. and Canada. It is written in a simple outline format, with links for further materials and 30 samples from contributors in the appendix. The team, led by PSI Founder Jane Honikman, gave generously of their time, information, and materials in this project. This is the second edition of this booklet and is a perfect complement to Jane Honikman’s books on building a network, available at www.janehonikman.com. 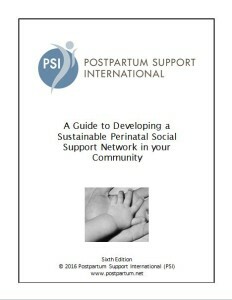 All proceeds from the sale of the book go directly to funds to support PSI Volunteers. You can download an Guidebook Order Form (PDF) here or you can purchase online below.